When Fresno State begins classes for the fall semester, Thursday Aug. 22, the campus will open with approximately 22,710 students, exceeding enrollment projections. Also new this year is university president, Dr. Joseph I. Castro, who began his presidency Aug. 1. The newest Bulldog welcomed faculty and staff back to campus Monday at the annual Fall Faculty/Staff Assembly where he delivered his first state-of-the-campus address. With that charge, the campus is geared up for the return of students Thursday. Welcome Week activities begin Aug. 26 with the Welcome Bash on the USU Balcony. President Castro will meet parents at the Parent Welcome, 6-8 p.m. Tuesday, Aug. 27 at the Smittcamp Alumni House. The annual Student Affairs SAFARI resource program, Sept.11 on the USU Balcony, will connect students with offices and programs that offer academic support. The projected 22,710 student figure is 150 more than last year. A record number of 3,339 freshmen are projected along with 2,225 upper division transfer students, also a record. More than 700 new graduate/credential students are also expected to begin classes this week, said Dr. Paul M. Oliaro, Fresno State’s vice president for Student Affairs. “Having a budget approved early and no fee increase has made it easier for families to plan for this year,” Oliaro said. 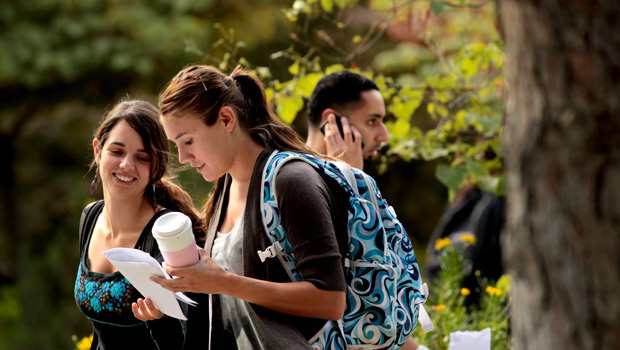 Official enrollment figures are released in late September. Record numbers are also found in Fresno State’s International Student Services and Programs, which is enrolling more than 300 new international students — about 130 more than last year. Of those, 470 students are seeking degrees, 72 are exchange students or scholars through various programs and 65 are a part of the Intensive English Program through Fresno State’s American English Institute. With this campus life renewal, traffic is expected to increase. University Police remind students and employees to arrive early to allow time to look for parking. The campus has a total of 7,452 parking spaces — approximately 4,700 of which are designated for students. During the first two days of school, students will be greeted by volunteers at three booths around campus staffed by New Student Orientation leaders. These volunteers will help new students find classes and navigate first-week issues. Free items including maps and planners will be given away at the booths, which will be open Thursday and Friday from 7:30-11 a.m. The booths will be located at Jackson and San Ramon Avenues (coming from Lot Q on Barstow Ave.); between the residence halls and the Madden Library; and in front of the Joyal Administration Building. What’s in store for students? At the Kennel Bookstore on campus, director Curt Parkinson reports continued growth in rentals of textbooks. He says more than 1,000 titles are available to rent this semester, compared to 650 last semester. “This can save students up to 70 percent compared to the new textbook price,” said Parkinson. Other new features are a bike shelter at University Courtyard and private safes for residents in the University Courtyard halls. The “Bulldog Bodega,” a new convenience store located in the North Gym, will be open late at night to assist campus residents with their shopping needs. Hours of operation will be noon -10 p.m. Monday-Thursday and noon-9 p.m. Friday-Sunday. Fresno State’s 57-year-old campus water tower that stores the campus drinking water got a facelift over the summer. It now has a new coat of white paint and two 15-by-10 foot high vinyl logos reflecting the university’s recent branding initiative. A new, personalized matching service that links individual students with student organizations will be offered by the Office of Student Involvement through its Campus Involvement Ambassadors program, a student leadership team of about 12 students. “This matching service is designed to help our new freshmen commuters and residence hall students, as well as our new international students, to begin their journey at Fresno State,” said Melissa Ginotti, Fresno State’s new director of Student Involvement. A new leadership program in the Student Involvement office expands opportunities for students to gain knowledge and participate in out-of-class learning experiences. The Academic Test Center has expanded to accommodate more courses and students. In the University Student Union Lounge, students will find new chairs, couches and tables with power for laptops. Cell phone charging stations were installed throughout the USU. New scoring monitors were installed in the USU’s Bowling Center. Landscaping and pavement improvements were completed outside of the USU. The Bucket Pub and Grill has a new interior look. The Alice Peters Auditorium in the Peters Business Building was upgraded to meet ADA requirements and improve seating. Box at Fresno State will offer cloud-based storage to all enrolled students. Some classes will offer application streaming to make academic software available to students on their own devices. Upgraded technology has been installed in 130 “smart” classrooms. The pay-for-print service was new printers and can accept print requests via email and the web. Dr. Andrew Hoff, who planned to retire this summer after a distinguished three-decade career at Fresno State, will remain to serve as interim provost after former Provost William Covino was appointed president of Cal State Los Angeles by the CSU Board of Trustees in May. Christina “Tina” Beddall, who served as the Fresno State Registrar for 19 years, is now director of Admissions, Records, and Evaluations (ARE). Ivàn Pagàn is the new director of the Learning Center. He has served as director of the Center for Student Success at CSU, Monterey Bay and as director of Academic Advising and Tutorial Services at Saint Mary’s College of California. Shirley Melikian Armbruster was named associate vice president for University Communications and Integrated Marketing following a national search. She had served in the position on an interim basis since 2008. Other new faces in the past year include Dr. Susan Elrod, named dean of the School of Science and Mathematics in December; Dr. Jody Hironaka-Juteau, named interim dean of the College of Health and Human Services in April; and Dr. Sandra Witte named interim Graduate Dean earlier this month to replace Sharon Brown-Welty who decided to transition to faculty.